The best part is that this comes in a little kit with pre-cut pieces and directions. It just doesn't get much better than that, and will be done in no time at all! We were all out of the kits, but our stock has been replenished. So now is the time to make your move. Come in or call (651-429-1039). And if you want to work on something a little more involved, but still totally fun for Halloween, take a peek at this wonderful needlework design from Crabapple Hill. Sharon stitched this up for display, quilting by Janet Hanson, Grand Quilted Glories. Beautiful! The stitchery includes shading with the use of crayons, adding a whole new dimension. Although we do focus on quilting at Bear Patch, we also are lovers of most kinds of fiber and fabric. This includes a random garment here and there. I guess I started out on doll clothes and my own clothes, making plenty of both before I ever even had a notion to make a quilt. 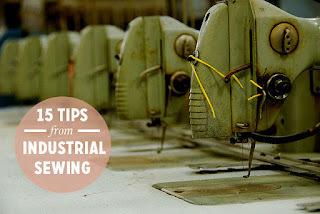 So when I saw this list of tips for improving the process of garment sewing, I knew I needed to check it out. I learned about this through the Bernina USA Facebook posting, so if you aren't already a "Facebook Friend" you should consider doing that. There just might be more good things there to help you with all kinds of sewing. We have 30+ new quilts and projects hanging in the store--here is a sample of the classes offered this fall. For complete information, please visit out website.